The first subject for our ROSES AND THORNS is the newest dance ensemble production touring the USA at this moment, EKAANTHA SEETHA, with choreography and performances by VP Dhananjayan and Shanta Dhananjayan. Already I have received many shocked and angry comments from artistes who are my colleagues in the field and who, do not want to be quoted since they hold the Dhananjayans in high regard. The production, which I have not seen at all but have heard only negative responses in Chennai where it premiered, deserves to be examined from many points. Is it an example of "diasporic drivel," "creative brilliance" or "tired and worn out imaginations of middle aged mamas and mamis"? Are dance dramas like these necessary to bind the Indian community together in North America to remind them about "eternal spiritual values"? "Are we rearing a new generation to revere from outward posturing rather than inward exploration?" We will let the viewers express themselves. As managing editor of this site, I stand by critic Vasanthi Sankaranarayanan's review which has elicited raves by itself from the many in this city who saw Ekaantha Seetha and did not like it! After the premiere in Toronto in September, this production has continued on to various cities in the US, enjoying more than 20 shows. The various comments and reviews posted below reflect the range of opinions that the production has evoked. When former editor of KALA magazine in Toronto, Ramakrishnan wrote a scathing review of the work, guru Dhananjayan was swift in hinting at legal action. The offending sentences were since removed. The sensitivity of artists against criticism is an aspect that Ekaantha Seetha has thrown up for narthaki.com readers. Can senior gurus be criticized dispassionately? Is the fear of 'disrespect' too great to be objective? 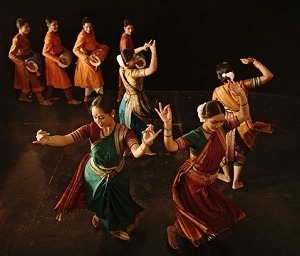 Now that Bush is out of office, and the Dems have the House and the Senate, can there be an opposing voice to the tyranny of Republicans / Bharatanatyam gurus? The sledgehammer that senior gurus wield over anyone who disagrees is evident from the rave reviews that Ekaantha Seetha has elicited from the NRI community press. The two strongly dissenting voices - both from Toronto - are a minority. We live in an age of spectacle and the larger, more glossy and more glitzy the better. Are we seeing a true renaissance of classical Bharatanatyam in its solo and group avatars for NRI audiences to flock to dance shows double billed as "Indian Culture Expos"? One point is clear. The tastes of the NRI public in North American is vastly different from those in India. Here, in India, the audience is mature and nuanced. Writers, poets, philosophers, yoga practitioners, painters, sculptors and film makers rarely attend classical dances any longer for their 'patriarchal framing' and 'male-gaze optic'. Read on and find out for yourselves.